The vast majority of agency marketers agree–goals are not only important but that in setting them, performance improves. 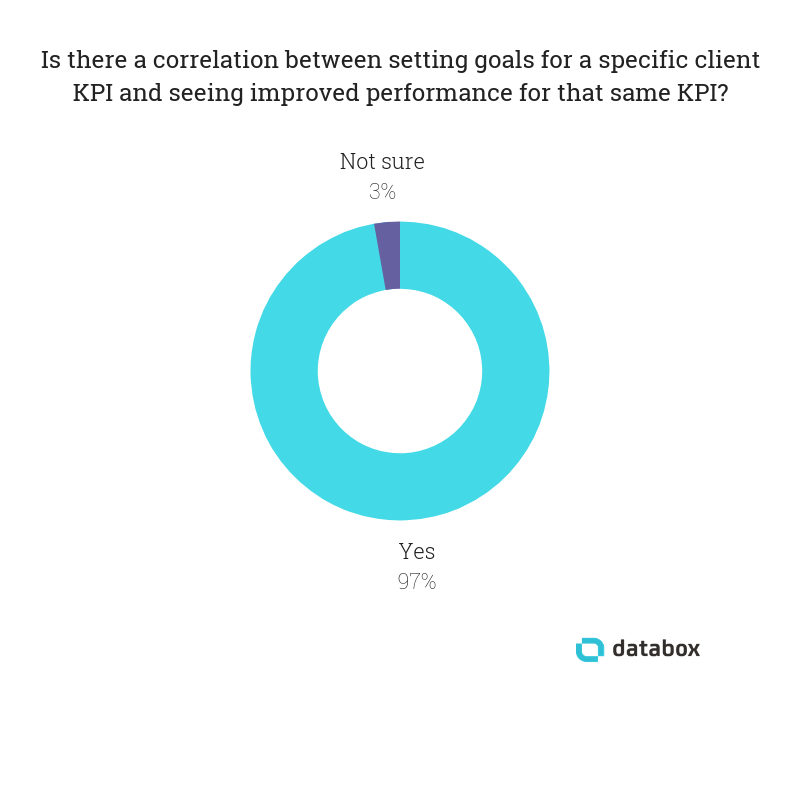 According to our latest research, 97% of agency marketers say that setting goals for a specific client KPI leads to improvement in that KPI. But herein lies the challenge–many agency clients don’t have goals. In many cases, they aren’t sure how to set them. After polling dozens of agencies on the subject, we learned that 48% of agencies say that only about 25% of their clients come to them with clear goals already in place. 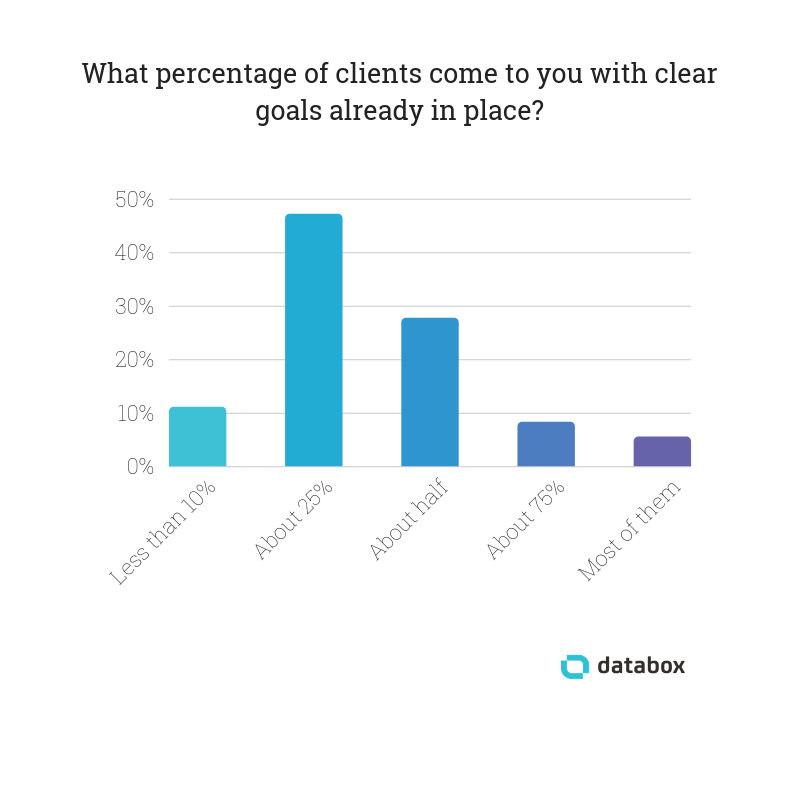 28% of agencies said about half of their clients already have goals in place, and 11% said less than 10% of their clients do. So, in most cases, it falls on the agency to help their clients determine their goals. 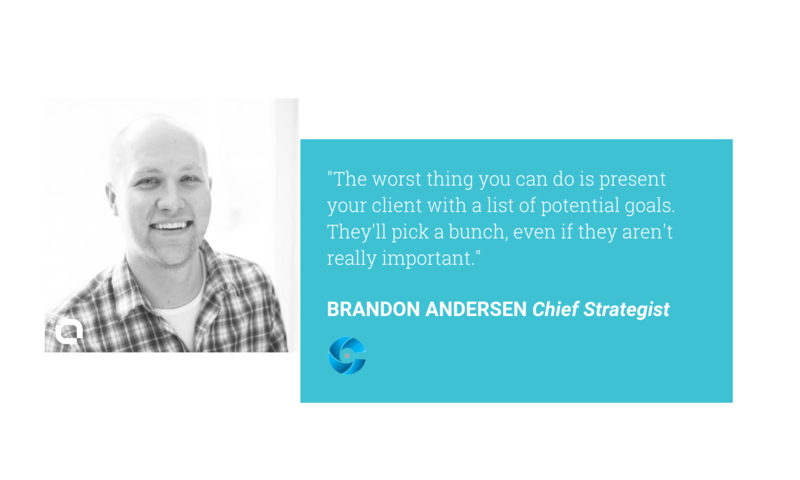 But there are lots of ways you might go about setting client goals for clients when they don’t have any in place. Here are a few we learned. Editor’s note: Looking for an easier way to track and manage the goals you set for your clients? See how you can set, assign, and monitor all of your client goals on one screen with Databox. 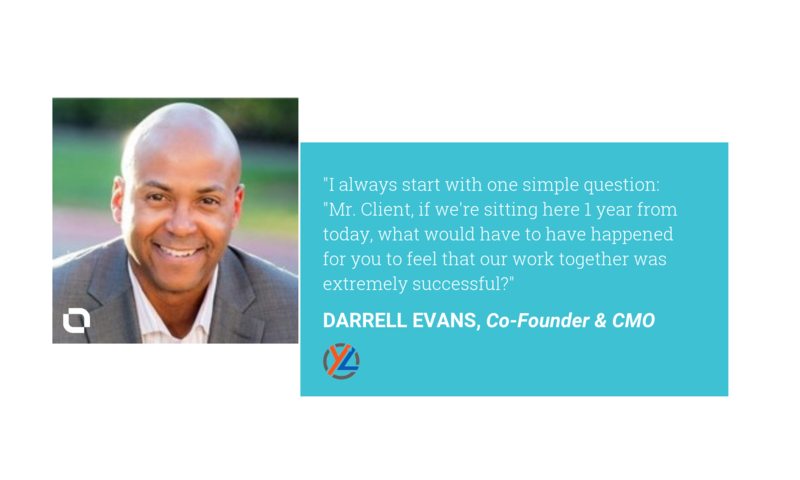 “When clients do not have clear goals in place for their department or marketing efforts, I always recommend working backward by beginning to ask questions about what is important to the organization,” says SmartBug Media‘s Drew Cohen. “Start with average deal size and the overall revenue goal,” suggests LyntonWeb‘s Jennifer Lux. Denamico uses a “simple, interactive conversion calculator we’ve built out to show how increases in website traffic and conversion rates can equate to more leads and closed sales—similar to a pipeline performance datawall,” says Adam Stewart. How will it improve your life/Why does it matter? Who must do what to achieve it/what capabilities do you need? “Sometimes [clients will] say vague things such as, ‘I want more clients,’ or ‘I need more revenue,'” says Myrna Arroyo from Pepper Inbound Marketing. Fannit starts “by analyzing business and marketing performance to date,” says Neil Eneix. Clients “need to set realistic goals,” says Rachel Lindteigen of Etched Marketing. Bold Digital Architects focuses on conversion rates and marketing expenditures, according to Noa Eshed. But sometimes companies don’t have that information available. “For clients with no goals/objectives in place, we fall back on industry benchmarks and averages instead and then work from there,” says Leighton Interactive‘s Travis McGinnis. Johnathan Dane from Klientboost gives advice on what to do when you don’t have historical data. “By looking at our past projects in the same or similar industry, we’re able to benchmark realistic goals around not only passed leads but pipeline revenue and ROI,” says demandDrive‘s AJ Alonzo. “This is what being a trusted advisor to your clients is all about,” says Stephan Roussan of ICVM. But that doesn’t always work, says Roussan. Unfortunately, it’s not always that easy, says Jake Fisher of Bridges Strategies. Have you ever had to drop a client because they couldn’t set reasonable goals? Do you have goal-setting strategies that you use with your own customers? Let us know in the comments below.